Pope Francis on Friday once more hit out against the powerful networks of corruption, reminding those involved they are dealing with the goods of others, not theirs. 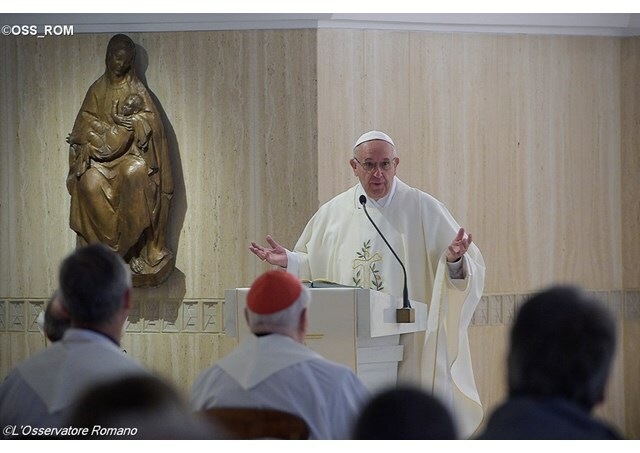 Delivering a homily during his Mass at the Casa Santa Marta residence in the Vatican, the Pope commented on the Gospel of Luke where Jesus recounts the parable of the dishonest steward who later strikes deals with his master’s debtors. Describing the dealing as “a true ring of corruption” the Pope said this true even in our days. “Those involved in these corruption rings are so powerful they are like the mafia.” This, the Pope said, is fact and not a fairy tale or something from ancient history. We find them daily in newspapers, especially those who administer public goods, which is not theirs. There is no question about corruption with one’s own goods because they are always defended. The Holy Father said that the lesson that Jesus wishes to draw from the parable is the greater craftiness of the “children of this world” compared to the children of light. Their greater corruption and cunning is carried forward in “style” and “silk gloves”. ‎The Pope pointed out that there are many among Christians who are corrupt. If they are more crafty than those faithful to Jesus, the Pope wondered whether there exists something like “Christian craftiness”, something for those who want to follow Jesus without ending up badly. What is this “Christian craftiness” that is not sin but helps me to go ahead in the service of the Lord, including with the help of others, the Pope asked. If there is a Gospel path and “Christian ‘track’ to follow without falling into the ring of corruption”, the Pope said, Jesus points it out with some contrasts, such as when he speaks about Christians as “lambs among wolves” or “prudent as serpents and simple as doves.” In this regard the Pope pointed to 3 attitudes of Christian craftiness. The first is a “healthy mistrust”, which means to be careful of someone who “promises too much” and “talks much” like those who ask you to invest in his bank for a “double interest”. The second attitude is reflection when faced with the seductions of the devil who knows our weaknesses; and lastly, prayer. Pope Francis invited the faithful to pray to the Lord to grant them this grace to be cunning Christians, to have this Christian craftiness and Christian “track”. If there is one thing that a Christian cannot allow himself, it is being naive. The Pope said that Christians have a treasure within - the Holy Spirit – which we have to safeguard; and being naive would rob one of the Spirit.